The following information is for all participants in the drive. If you have not yet registered, please register here. When significant updates are made to this information, email will be sent to all participants with the updates. There are three primary directions people will be traveling to get to Boone, from the East, West, and South. So let's look at the current numbers. The arrival strategy will be broken up into these three directions, with each direction detailed below. The rated miles numbers below are conservative to ensure you have range to get back to the supercharger specified with comfortable buffer. You are free to do your own calculations and planning, this is just suggested guidance with buffer. Standard EV chargers exist along the route as well and can be found in Plugshare.com, but with the large number of cars there's no guarantee someone else isn't planning to use the same charger you are. Please note that guidance is based on standard wheel size. If you have larger wheels, range will be reduced and is noted in recommendations base on the following percentages. With the large number of cars coming from the East, we will not be trying to caravan up to Boone as this would concentrate too many cars at one time at the Greensboro supercharger. We would rather request people come when they wish (early is good!) so a more staggered approach happens. Lunch will be from 11:00 to 1:30 (see the Lunch section below) allowing people to arrive at different times. 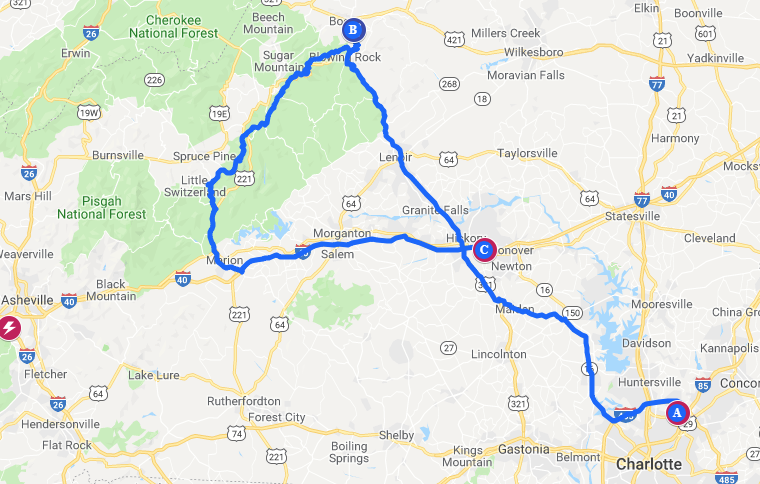 Those not capable of charging to the rated miles above are recommended to avoid the Greensboro supercharger and continue on to the Hickory supercharger. Those that prefer to use Hickory are certainly welcome to as well. See Hickory Loop section. 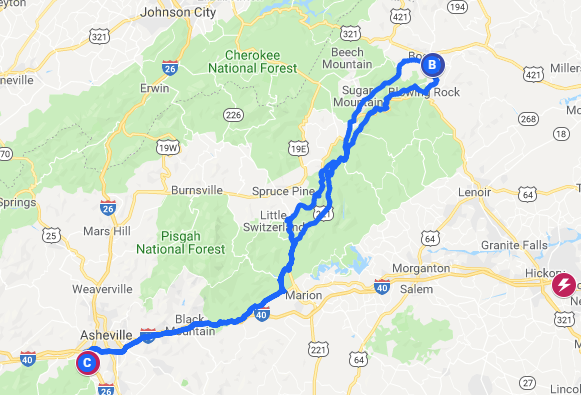 Those not capable of charging to the rated miles above are recommended to travel to the Hickory supercharger and complete the route through Boone and back to Asheville from there. 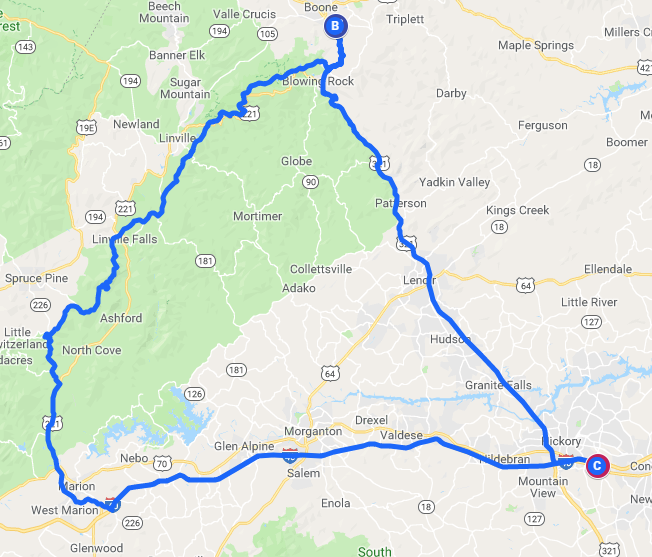 Charging values in the Hickory Loop section are the same for the route from Hickory to Boone to Asheville. Those not capable of charging to the rated miles above are recommended to use the Hickory supercharger. See Hickory Loop section. There is also a shorter route From Boone to Hickory, taking off 25 miles, should anyone need that option. Please plan to arrive between 11AM and 1PM at Makoto's. Lunch will be served from 11AM with the restaurant closing at 2PM when we depart the parking lot. Arriving after 1PM may not allow enough time for lunch. You may also eat at alternate locations in Boone but check-in is in the parking lot of Makoto's (or inside Makoto's if there is heavy rain at the time). Western NC Tesla Owners have organized the drive down the Blue Ridge Parkway and have put together the incredible video below. As noted in the video, after discussions with Blue Ridge Parkway officials, we will be leaving in separate groups to prevent congestion and meet Blue Ridge Parkway requirements. For the month of October they do not allow more than 25 cars to travel in a single group on the parkway. Specifics of plans discussed in the video may alter depending on weather and traffic conditions encountered. For example, rain during the drive would prevent drone operation and some of the discussed route specifics would not be necessary. Excessive traffic on the parkway may impact some details as well. Also, when you watch the video, don't worry about the complexity of the routes. There will be designated leaders for each group with radios coordinating things. Also, if you wish to just drive straight through without any of the extra route complexity, only group 1 and 2 will be doing that and you can choose to be in group 3 (and possibly group 4 if there are enough cars) which will only be grouping together and driving straight through. IMPORTANT NOTE: There is little to no cell coverage on the section of the Blue Ridge Parkway we will be driving down. The following information is for participants that will be going to the Hickory supercharger at the end of the drive. This will be most participants with exception of those coming from the West (Ashville) as they will be returning that direction. For everyone else, there will be a lot of thirsty Teslas headed to Hickory at the same time. Group 2 is the default group unless you choose otherwise. We will ask in an upcoming survey what group you would like to be in, but you may decide different charging priority when arriving at the Hickory supercharger.